The Lutherhaus in Wittenberg, Germany, is located in the Augustinian monastery where Martin Luther lived much of his life, first as a monk and later as a pastor, husband and father. It was here Luther wrote his “Ninety-Five Theses,” settled into married life, delivered his famous table talks, and wrote so many of the books and missives that would come to define him. Today it is the world’s largest museum dedicated to the Protestant Reformation and much of it, particularly the “Luther Hall,” has been preserved in its original state. If you were to visit the museum today you would see an impressive collection of artifacts related to Martin Luther: his desk, his teaching robe, his pulpit, first editions of his books. And among the artifacts you would also spot a small chest. 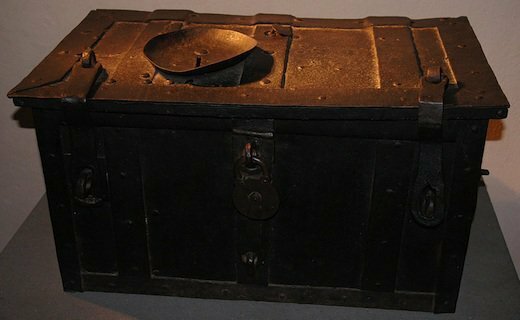 This chest and others like it would play a critical role in the history of the church and for that reason we look to it as another of the 25 objects through which we can trace the history of Christianity. Martin Luther was born on the tenth of November, 1483 in Eisleben, Saxony. His father was an ambitious and accomplished man who wanted his son to succeed in the world and for that reason sent him to fine schools. In 1501 Luther entered the University of Erfurt. A brilliant student, he earned both a Bachelor’s and Master’s degree within just four years. He soon enrolled in law school and was on the path to becoming a lawyer when in the summer of 1505 he was caught outdoors in a terrible thunderstorm. Terrified by a nearby lightning strike he cried out, “Help, St. Anne! I will become a monk!” Though he regretted this rash vow, he immediately dropped out of law school, sold his books, and entered an Augustinian monastery. Luther was a monk dedicated to his calling. He would later say, “If anyone could have gained heaven as a monk, then I would certainly have done so.” He fasted, prayed, studied, went on pilgrimages, and confessed constantly, but was in continual despair, unable to find peace and unable to find any assurance of God’s love and acceptance of even so committed a Christian. Luther continued on his academic trajectory and by October 1512 he had earned two more Bachelor’s degrees and a Doctorate of Theology. His academic pursuits drove him to study the Bible in depth and as he did so, he began to dispute the church’s teaching on justification. As Luther was awakening to a new understanding of justification, the Roman Catholic Church sent Johann Tetzel throughout Germany. Tetzel, a Dominican friar, was tasked with selling indulgences that would raise money to rebuild St. Peter’s Basilica. Indulgences were dispensed by the church as a means of shortening the purchaser’s time in Purgatory. They depended upon two beliefs deeply ingrained within Roman Catholicism. The first is that the guilt of sin is not forgiven through absolution alone, but must be completed by temporal punishment; the second is the existence of Purgatory where the sinner would continue to cancel the debt of his sins until God’s wrath was expiated. One of those coffers is on display today in the Lutherhaus museum. It is a plain and unadorned box, notable only for a coin slot in the lid. Its significance is found far more in what it represents than in what it actually is. The pennies that slid through the slot and into the coffer represented a gospel of salvation by works, a gospel foreign to the Bible, a false gospel. Luther had recovered the great doctrine of justification by grace alone through faith alone, and there would be no place for indulgences and no place for meritorious good works. Reformation had begun and it would soon spread across Germany, across Europe, and then across the world. The visitor to the Lutherhaus museum must note the irony that this box rests in a musem dedicated to the man who fought so hard to raise a better, purer gospel. Sources cited: CCEL, The Resurgence, Britannica.